There are currently 78,143 users on this website. Old Coin In A Clasp. It seems like the clasp hasn't damaged the coin. My mom gave me this and had no idea what the coin inside is. My friend says early Roman copper coin, I've been scanning haven't found it yet. Thanks for the help! Looks like a Roman Constantine ancient coin. coin section, and you should get some replies. Thanks GR someone moved it! The obverse legend is CONSTANTINVS IVN NOB C (= CONSTANTINVS IVNIOR NOBILISSIMVS CAESAR, "Constantine Junior Most Noble Caesar"). Constantine II as Caesar (junior emperor), 317-337, under his father Constantine I "The Great". The reverse legend GLORIA EXERCITVS means "Glory of the army". The letters below look like PLG which would stand for the Lugdunum (Lyons) mint. This coin type was issued between about 330 and 335. A nice but quite common coin. Thanks a lot kushanshah. I had a feeling the clasp was more valuable than the coin. I looked for it and there are a lot more Roman coins than I expected. I had a feeling the clasp was more valuable than the coin. If that clasp is 14k or even 10k gold then yes it likely is. And yes there are a lot of ancient coins out there. It's a surprise to all of us when we start. But just because they are plentiful doesn't detract from holding something 1700 years old (as with your coin) or older. 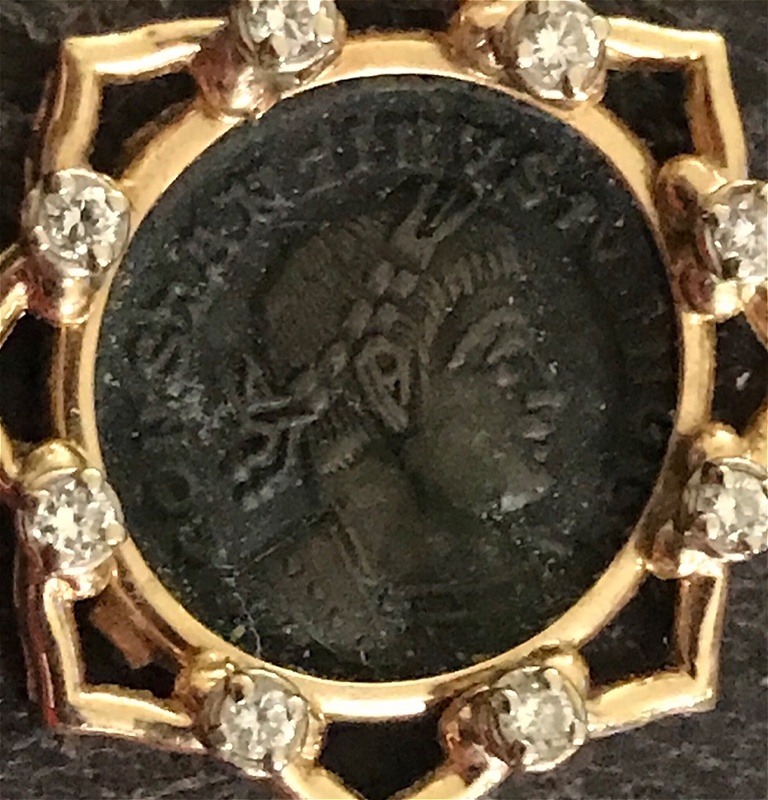 If you want to see what your coin would look like without the clasp, see some examples on this Wildwinds page; scroll down to the entries around "Lyons RIC VII 254". These clasps almost always do damage the coin, unless the jeweller has been very, very careful and the jewellery-piece hasn't been worn very much. The coin will likely suffer further damage if removal was attempted. As such, it is worth far more as an intact jwellery-piece than as a damaged coin and a lump of scrap gold and unidentified gemstones. Coin collectors, however, would probably not appreciate owning such a piece. I am wondering why someone would enframe a coin of Constantine II though. 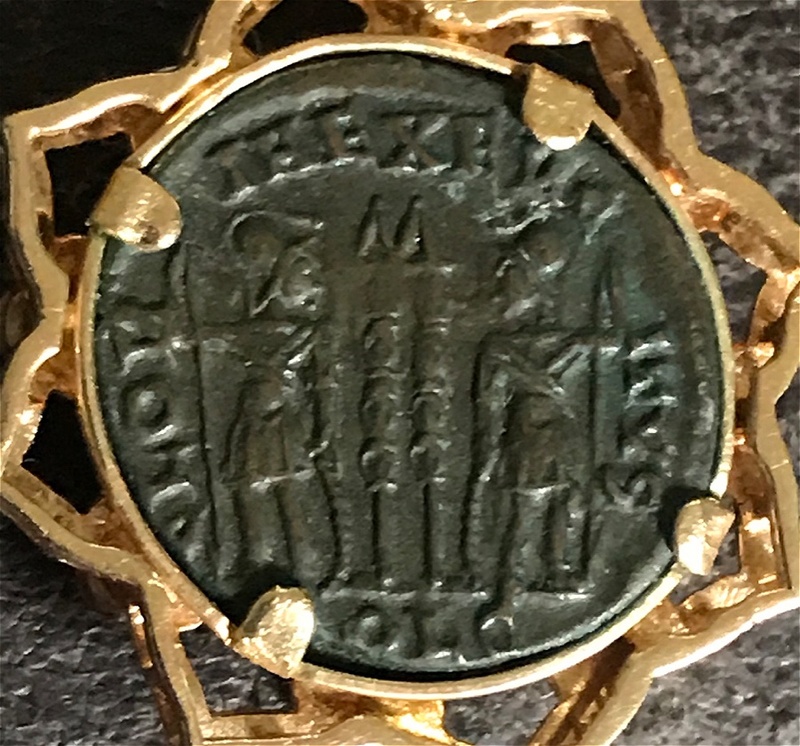 Perhaps a previous owner had mistaken it for a coin of his much much more famous - and much more likely to be revered - father; Constantine the Great is a Saint in the Orthodox church. I think you nailed it. It's got that icon look to it. People see the Constantius and assume it's dad.